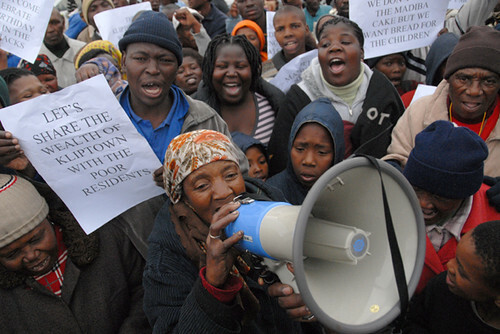 March 12, 2012 – Links International Journal of Socialist Renewal -- March 7 saw South Africa’s largest protest in several years when more than 200,000 workers took to the streets in 32 towns and cities across the country. More than 1.5 million workers stopped work. The strike – called by the Congress of South African Trade Unions (COSATU) to protest against the growing role of labour brokers and the introduction of road tolls -- was prompted by worsening poverty and working conditions in South Africa. There has been a steady decline in the wage share of national income, down from 56% in 1996 to less than 47% today. Durban, December 3, 2011. Photo by Anne Petermann/GJEP-GFC. February 28, 2012 -- Links International Journal of Socialist Renewal -- In 2007, former World Bank chief economist Nick Stern termed climate change the worst "market failure" in history – since those who pollute with greenhouse gases are not charged, and since they threaten future generations and vast swathes of natural life – and at that moment, even the 1991 ravings of another former World Bank chief economist, Larry Summers, made sense. "I think the economic logic behind dumping a load of toxic waste in the lowest-wage country is impeccable and we should face up that", according to a memo with Summers’ signature, although actually Summers was a mere plagiarist of Harvard economist Lant Pritchett’s genius, insiders allege. A protest by Kliptown Concerned Residents and the Anti Privatisation Forum. February 2012 -- Links International Journal of Socialist Renewal -- The political dynamics of contemporary South Africa are rife with contradiction. On one hand, it is among the most consistently contentious places on earth, with insurgent communities capable of mounting disruptive protest on a nearly constant basis, rooted in the poor areas of the half-dozen major cities as well as neglected and multiply-oppressed black residential areas of declining towns. On the other hand, even the best-known contemporary South African social movements, for all their sound, lack a certain measure of fury. February 15, 2012 – Links International Journal of Socialist Renewal -- The latest acts in South Africa’s’s intensifying political drama include a sizzling summer-long battle between young and old within the African National Congress (ANC), the February 10 State of the Nation speech by President Jacob Zuma and the release of the ANC’s “research” on alternatives to mining nationalisation, a demand by the ANC Youth League which is now one of the main issues dividing the ruling party. January 12, 2012 -- Pambazuka News, posted at Links International Journal of Socialist Renewal with permission -- The centenary celebrations of the African National Congress (ANC) are being used to persuade the people that a movement that has betrayed the people is our government; a government that obeys the people, instead of a government of the elites, for the elites and by the elites. It is a hugely expensive spectacle designed to drug us against our own oppression and disempowerment. 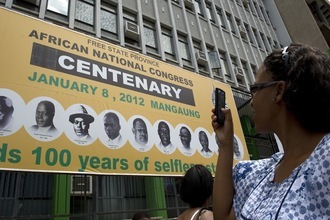 January 6, 2012 -- The Bullet -- There is good and obvious reason to celebrate the long history of the African National Congress (ANC): the organisation's marked dedication over 100 years -- since its founding in 1912 -- to the cause of the betterment of the lot of the oppressed African people in South Africa. It has also sustained an honourable commitment to a multiracial, pan-ethnic outcome to the struggle against the unequivocally racist system that both segregation and apartheid came to represent for so long in South Africa. And, not least important, the ANC is now in power. DON'T LET AFRICA FRY: ZUMA'S GOONS ATTACK from Jadis on Vimeo. 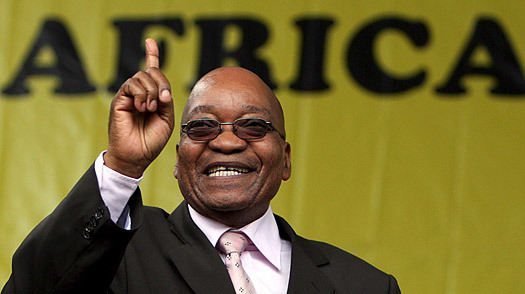 South Africa's president Zuma watched as ANC supporters assaulted peaceful demonstrators. December 8, 2011 -- Earthlife Africa issued a statement describing the events. It describes how during a meeting between South Africa' President Jacob Zuma and communities and civil society groups, violence broke out. After peaceful demonstrators silently held up signs asking “Zuma to stand with Africa”, pro-ANC goons, many wearing the official green uniforms of the COP17 "volunteers", violently attacked the demonstrators. Demonstrators were roughed up and some had to flee the hall. While all of this went on, Zuma sat on the podium and remained quiet. It took nearly 10 minutes before police entered the hall to restore order. December 6, 2011 -- What, now, are the prospects for a climate deal by December 9? The biggest problem is obvious: Conference of the Parties 17 (COP17) saboteurs from the US State Department, joined by Canada, Russia and Japan, want to bury the legally binding Kyoto Protocol treaty. Instead of relaxing intellectual property rules on climate technology and providing a fair flow of finance, Washington offers only a non-binding "pledge and review" system. ANCYL members, employed as "host city volunteers" and dressed in green, clash with members of the Democratic Left Front, dressed in red, at the start of the rally. Photo by Sandile Ndlovu. December 3, 2011 -- Links International Journal of Socialist Renewal -- Mike Sutcliffe, the city manager of Durban Metro council, was forced to back down on his insistence that the December 3 global day of action march against climate change only comprise 100 people. Failing in that attempt he went on to insist that the march route stay out of Durban CBD. He then reneged as Civil Society Committee for COP17 (C17) lawyers pushed him into a corner, where he was forced to accept the march route that was originally proposed by civil society. Above: Durban’s Climate Gamble editor Patrick Bond (right) and contributor Ashwin Desai provide a background to the Durban climate talks. Address by Zwelinzima Vavi, general secretary of the Congress of South African Trade Unions (COSATU) to the Russell Tribunal on Palestine, District Six Museum, Cape Town. The Russell Tribunal on Palestine's Cape Town hearings concluded that Israel is guilty of apartheid crimes. Its panel of jurists ruled that Israel's actions against the Palestinians breach the prohibition of apartheid under international law. Click here for more details of the tribunal's findings. King Mswati III: sitting pretty after ANC "bail out". August 5, 2011 -- South Africa's African National Congress government has defied supporters of democracy in Swaziland and granted the repressive absolute monarchy a five-year, R2.4 billion loan. The bailout, which was announceded by King Mswati III on August 3, has been condemned by the Swazi democracy movement and its supporters in South Africa. While its conditions do not require democratic reforms, the Swazi people will be subject to harsh austerity in order for the regime to repay the loan. August 4, 2011 -- The Swaziland Solidarity Network (SSN) is calling upon the South African government to stop dilly dallying at a time when it has a genuine opportunity to exert pressure on Swazi authorities to stop human rights abuses and end the Tinkhundla dictatorship. WikiLeaks revealed Washington’s bullying, bribery and blackmail when promoting the non-binding 2009 Copenhagen Accord (being hatched by leaders above), a sham of a climate agreement designed to ditch Kyoto. South Africa’s president Jacob Zuma (in left corner) was an original signatory. July 19, 2011 – Links International Journal of Socialist Renewal -- When African National Congress Youth League leader Julius Malema recently proposed the mining industry’s partial nationalisation – and asked, quite legitimately, “what is the alternative?”, of those in the South African Communist Party (SACP) and Business Leadership South Africa who threw cold water at him – a debate of enormous ideological magnitude opened in public, which workers, communities and environmentalists have already joined in their myriad struggles. July 3, 2011 – Links International Journal of Socialist Renewal -- Two of South Africa’s greatest water warriors were not actually killed in conflict, though at the time of their deaths on June 22 and 23, both were furious with their traditional political party home, the ruling African National Congress (ANC). For former ANC cabinet minister Kader Asmal (whom Nelson Mandela once proposed be ANC chairperson), the party’s proposed legislation to snuff state information, nicknamed the “Secrecy Bill”, warranted spirited condemnation, and the airwaves rang with his principled liberal critique up through his last week. The day after he died (age 76), the ANC authorised sufficient revision to the bill that he probably would have declared victory. His funeral and memorial were given exceptionally high-profile coverage in the state press, befitting his status as a senior human rights lawyer and party intellectual. Hector Petersen was one of the first victims of the apartheid regime's attempts to crush the 1976 Soweto youth uprising. June 14, 2011 -- Abahlali baseMjondolo -- On Youth Day, June 16, this year the nation will be celebrating 35 years since the struggle of the youth for freedom, democracy, justice and equality in 1976. We as Abahlali youth agree that the courage of the youth of 1976 must be celebrated. But we also wish to bring back the truth and the dignity of those youth who sacrificed with their lives in 1976. We need to make that truth and dignity a living force now. The struggles of the past must not be misused to silence the struggles of the present. The struggles of the past must be used to support the struggles of the present. Every generation must be free to take their own struggle forward. April 24, 2011 -- Links International Journal of Socialist Renewal -- South Africa’s most vocal neoliberal politician, Trevor Manuel (pictured above), has just been named as co-chair of the Green Climate Fund. On April 28-29, 2011, in Mexico City, Manuel and other elites met to design the world’s biggest-ever replenishing pool of aid money: a promised US$100 billion of annual grants by 2020, more than the International Monetary Fund (IMF), World Bank and allied regional banks put together. The Climate Justice lobby is furious because, as the network of 90 progressive organisations wrote to the United Nations, “The integrity and potential of a truly just and effective climate fund has already been compromised by the 2010 Cancún decisions to involve the World Bank as interim trustee.” A Friends of the Earth International study earlier this month attacked the World Bank for increased coal financing, especially $3.75 billion loaned to South Africa’s Eskom a year ago. 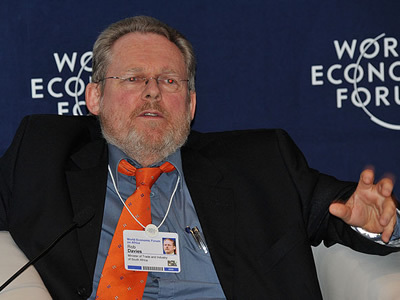 South Africa’s trade and industry minister Rob Davies. April 18, 2011 – Links International Journal of Socialist Renewal -- Hosting the Durban COP17 – let’s rename it the “Conference of Polluters” – starting in late November puts quite a burden on the African National Congress government in Pretoria: to pretend to be pro-green. One of South Africa's new breed of capitalist tycoons, multimillionaire Kenny Kunene. Others include former mineworkers' union leader Cyril Ramaphosa and former ANC Gauteng leader Tokyo Sexwale. January 10/February 9, 2011 -- South African Civil Society Information Service -- Amid all the usual political propaganda and grandstanding at the African National Congress (ANC)’s 99th anniversary rally in Polokwane on January 8, 2011, it was none other than ANC Youth League (ANCYL) president Julius Malema who came up with the most honest statement of the day. Defending himself against charges that he and his ANC Youth League cronies were continuing to economically benefit from associated businesses awarded government tenders; he argued that business is intrinsically elitist. As such, Malema claimed, “BEE will never be broad” – and in this rare case, he got it right. Dumping on Africans. "Durban's methane-electricity conversion at three local landfills shows the futility of the CDM, not to mention the historic injustice of keeping the Bisasar Road dump (Africa’s largest) open in spite of resident objections to environmental racism." February 2, 2011 – Links International Journal of Socialist Renewal -- It’s worth downloading a copy of the South African government’s new National Climate Change Response Green Paper (http://www.climateresponse.co.za) to prepare for the local deluge of technical and political debate for the next round of UN climate talks that Durban will host in eight months’ time.